Road Trips Gardeners who are orchid aficionados should be making tracks to southwest Florida right now! A rare Ghost Orchid (see photo!) has exploded into bloom in Corkscrew Swamp Sanctuary near Naples, Florida. The first flower opened the last week of June. There are now nine flowers visible, and buds continue to open. The buds open in succession, so there should be blooms visible through the end of July and possibly longer. In fact, it’s the fourth consecutive summer the orchid has produced multiple buds and blossoms. Area biologists have nicknamed this orchid specimen the “Super Ghost,” since typically Ghost Orchids might have between one and three blossoms per year, if they bloom at all — and this one regularly produces multiple buds and blossoms. The Ghost Orchid (Polyrrhiza lindenii) is an epiphytic orchid that grows without leaves on the trunks of trees in a small concentrated area of Southwest Florida. The plants are usually only visible to adventurers who hike through hip deep water in the area’s cypress, pop ash and pond apple sloughs to reach them. Preyed upon by poachers, the flower was the subject of bestselling author The Orchid Thief and the subsequent movie adaptation. For the past three summers, the plant experienced multiple bloom events and was in flower for months at a time, with thousands of people visiting to catch a glimpse of the rare plant in bloom from a public boardwalk with a spotting scope. If you’re coming just for the orchid, call ahead (239:348-9151) for daily updates on the flower’s status. Corkscrew Swamp Sanctuary, part of the National Audubon Society, is located at 375 Sanctuary Road West, Naples, Florida. It’s 15 miles from I-75 on Immokalee Road (Exit 111). Hours are 7 a.m. to 7:30 p.m. (April 11 through September 30, and 7 a.m. t 5:30 p.m. October 1 through April 10) with the last guests admitted by 6:30 pm each day. Admission is $10 for adults. Several Naples and Marco Island hotels are providing special Ghost Orchid rates for flower enthusiasts, ranging from $49 to $119 per night (some even have extra amenities such as breakfasts and dinners). Restaurants including Naples Tomato, The Dock at Crayton Cove and Riverwalk at Tin City are offering ”buy one entree, get one free” meals. To see all the “ghost orchid specials”, go online. For more information on Naples, Marco Island and the Everglades, check out The Paradise Coast. A recently released mystery novel, Ghost Orchid, is specifically about the “super ghost” of Blair Audubon Corkscrew Swamp Sanctuary, a unique plant with many firsts that take it beyond those searched for in the Fakahatchee Strand. Susan Orlean never actually saw a ghost orchid in the wild. That is beyond my comprehension. Words are my painting;how can I paint this beautiful plant without seeing it every day in all its mystical beauty? NPR Reviews praises Ghost Orchid for the beauty of the Everglades that shines through on every page; the ghost orchid the heart and soul of the story; the environment the main character. Photographers search for the perfect subject in the perfect light and find themselves wrapped in the aura of the ghost orchid and the question: Is love eternal? It’s unfortunate that the only view most have of the Everglades comes from The Orchid Thief. 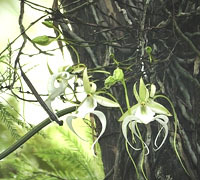 Susan Orlean also never saw a ghost orchid in the wild. There’s a serene and accessible swamp experience that is still mystical, magical and wonderful, the real Everglades without slogging through water and fighting off swamp angels and alligators. Inspired by the blooming of the ghost orchid on her birthday in 2007, novelist D. K. Christi wrote Ghost Orchid, a mystery about photographers searching for the perfect subject in the perfect light and caught in the aura of the mystical ghost orchid, high in the cypress canopy at Corkscrew Swamp. NPR reviews praises Ghost Orchid for the beauty of the Everglades that shines through on every page; the ghost orchid the heart and soul of the story; the environment the main character. Blair Audubon Corkscrew Swamp Sanctuary at the edge of the Everglades is totally accessible and the most magnificent ghost orchid, up to 20 blooms a season, is visible from the boardwalk with the naked eye and even better through a scope.